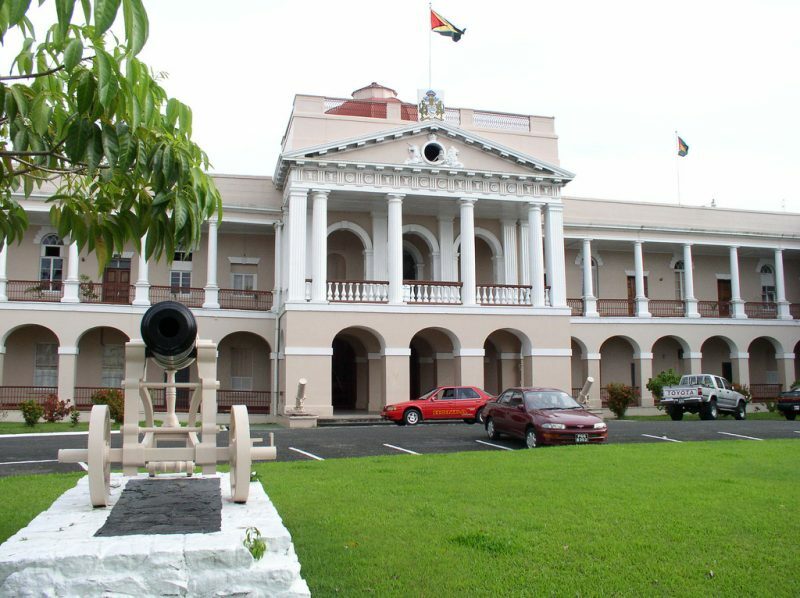 Guyana's parliament building. Photo by Scott Stadum, CC BY-NC 2.0. With a “yes” vote  by Charandass Persaud, a parliamentarian with the Alliance for Change (AFC) , one of the political parties that comprise the governing coalition, the no-confidence motion passed 33 to 32, leaving the government in disarray and facing the prospect of a general election. Constitutionally, that election must be held in 90 days — by March 2019 at the latest. Persaud, meanwhile, has since fled Guyana, claiming he's fearful  for his life. This, despite journalist Freddie Kissoon's revelation  that Persaud had confided intentions to form a new political party to contest the 2019 general elections. The move came amidst a swirl of corruption allegations  against the government by opposition leader Bharrat Jagdeo , as well as concerns about higher taxes, job losses and an increased cost of living. Prior to the vote, the coalition government made it clear that it was “not for sale” , but there has been online speculation  that — despite Persaud's insistence that he voted according to his conscience  — his no-confidence vote was bought and paid for. There has been no evidence  of this. Jagdeo, meanwhile, suggested  that Persaud's decision may have been influenced by the layoff of thousands of sugar workers in his constituency. Still, some onlookers feel that if Persaud was unhappy about how the government was managing certain sectors, abstention from the vote would have sent a strong message without undermining  his own government. Although the government chastised  the motion of no-confidence as “hypocritical” and “a diversion”, Guyana now finds itself in uncharted territory. Did the motion pass — or not? 33 is a rounding down of what constitutes half of the house. The motion consequently was not carried. For a no confidence motion to succeed Article 106(6) of the Constitution requires ‘the vote of a majority of all the elected members of the National Assembly…’ 33 as against 32 is a majority. When I said that two votes were required for the no confidence motion to succeed, I was obviously wrong. I meant two abstentions. He later noted  that the bigger issue was the country's one-party majority rule. The result showed up the dissension happening within the coalition government . Earlier this year, for instance, some coalition-affiliated columnists were dropped  from the state-owned Guyana Chronicle newspaper, a move thought to silence their criticism  of the government. People treating Charandass Persaud's betrayal as if it's the disease itself as opposed to a symptom of it. Carry on. Let one man's action suddenly erode all the dysfunction that preceded it. In a country with a troubled history  of race-based politics, Guyana's ethnic demographic  may strongly influence the upcoming elections. Indo-Guyanese make up about 44 percent of the population, and people of African descent account for an approximate 30 percent. As Johnson suggests, the opposition PPP (with a strong Indian support base) may get the plurality of the vote in a general election, but this may not necessarily represent a majority in parliament. In fact, the previous PPP administration was a minority government. In some quarters, therefore, Persaud's vote is being denounced as a supremely political move, designed to change the balance of power in parliament. We have become so fragmented as a people that everytime there is an elections upcoming we see the ugly side of people. We can't blame the Politicans who capitalize on this, that's on us. We have to be different if we wish to see a better Guyana. On social media, several people felt that the way out of the morass lay with young people . In a Facebook update, Elsie A. Harry also addressed the youth , and Joel Hinds posted a list  of questions that he felt young people should ask their leaders prior to the 2019 elections. According to the country's constitution, the president and members of the cabinet must resign, but that doesn't mean Guyana is without a government. The current administration will act in a custodian-type role, tending to the day-to-day needs of running a country as it prepares for general elections. Housekeeping related to Guyana's new-found oil and gas sector, still in need of adequately protective legislation, ranks high in priority, especially since Exxon Mobil plans to begin offshore production  by 2020. There is, however, some concern  over the ability of the Guyana Elections Commission “to reactivate the election machinery for general elections”, especially since the chairman has been ill, causing the postponement of all meetings until January 2019. According to veteran journalist Wesley Gibbings, who has covered several Guyanese elections, political chaos resulting from the no-confidence vote may have an upside. Speaking with Global Voices via WhatsApp, Gibbings praised the fact that in prior elections, Guyana's media performance was directly linked to the integrity of the election process and public acceptance of its outcome, as determined by the Carter Center, a US-based human rights organisation. In conjunction with regional media practitioners, the organisation helped establish a media monitoring system with a strict journalistic code of conduct  specific to election coverage. The system tracks how many stories were published or broadcast and can identify who was quoted, helping to ensure balanced reporting. Still, if the current pitch of public debate continues, Guyana may find itself mired in old politics and fears . Following the vote, the streets of the capital city, Georgetown — usually bustling with last-minute Christmas shoppers — were empty.